[Tempt One] is a graffiti artist who has Lou Gehrig’s disease. He can no longer physically produce art, since his disease has taken his ability to control his arms. His friends, won’t let that be the end of it though. They’re building a visual tracking system to let him work by moving his eye. It seems like it would be very difficult to get any kind of a smooth curve out of eye movement, but the short demonstration video, which you can see after the break, does a decent job, at least for something this early in development. The source code isn’t released yet, but they do plan to do so. If you wanted to make your own, you could find some info in a past post of ours. We’re guessing they intend to use it with something along the lines of the laser tagging system. 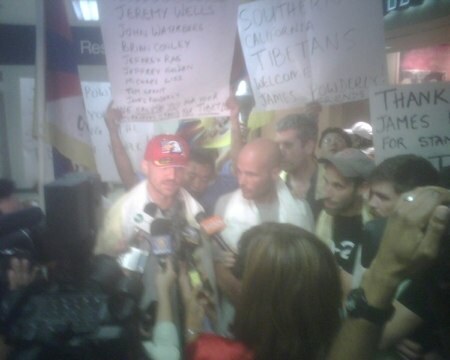 Graffiti Research Lab’s [James Powderly] along with 9 other Tibet supporters were deported from China during the Olympic’s closing ceremonies. Detained on the 19th, the activists were to serve a 10 day sentence, but the Chinese government buckled under international pressure and deported them early. This brings the total number of deported activists to 53 since the start of the games. Graffiti Research Lab is well known for its laser tagging research. [Sittiphol Phanvilai]’s multitouch screen project was posted a couple different places today. It uses the Nokia N95 to track light pens and draws the resulting paths on the video output. We immediately saw the applications for this in laser tagging. Right now if you want to do laser tagging you need to haul a laptop with you in addition to the projector. With some modification to the NeuScreen software you could replace the laptop with just cellphone plugged directly into the projector.